Mountain Landscape scenery in New Zealand is so amazing that it’s hard to do a lousy photo. Any direction you point the camera, the masterpiece is there for you. But of all places, Milford Sound (Piopiotahi) is the best and the most picturesque one. It is hard to reach – there is only one road, which is prone to closing. It may be closed due to the landslide or due to the Homer tunnel freezing. And if you get stuck in Milford Sound with the frozen tunnel, then you’ll need to wait until it melts. Milford Sound is known for severe weather; it’s one of the rainiest places on Earth. 300+ rainy days a year is no joke. That was the second reason why I allowed three days for the visit. The first reason was, of course, the grandeur of the place. The first day had a little of the light shining through the clouds, but the sky turned overcast just before sunset, no magic happened. The second day was an overly cloudy start to finish with no light show. The third day started with such a mighty rain that I didn’t bother going out for the sunrise. The waterfalls multiplied, the lake went far beyond the borders and even got waves. The closest waterfall roared and peaked in power. As a long-term photographer, I knew that the fascinating lighting conditions happen when the weather changes. For instance, after the rain. So I waited in my rain jacket for IT to arrive. And it really did! I took the photo below a little later when the lake receded a bit, and other people started to walk around. I saw that guy and had the picture instantly in my mind. So I stalked him a bit and waited for the God Rays to appear. Piopiotahi at its best. Three shots with bracketing, making it six shots in total. f/16, 1/5 sec, ISO 100, Nikon d750, Tamron 15-30 / 2.8. 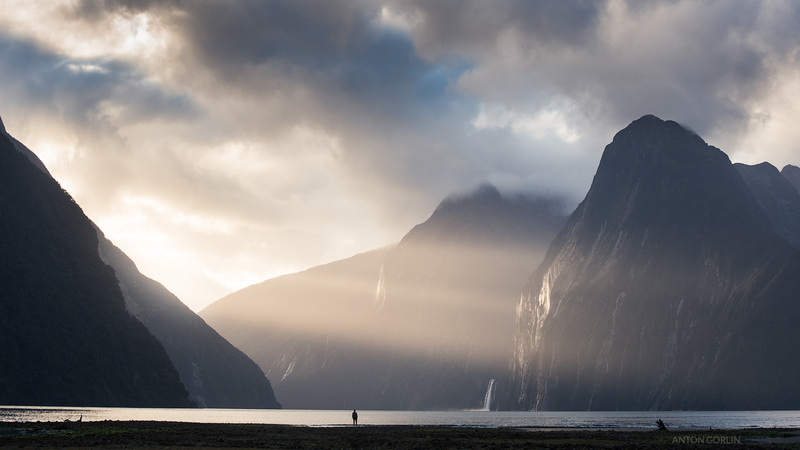 Magnificent photo and article that made me place Milford Sound again on my places-to-go list! Thanks for the warning to plan more then one day there. happy you liked it! there is one more warning! WEAR GLOVES!!! Otherwise, the sandflies will eat you alive.